A novel set in prehistoric times, or in which the principal characters are members of a prehistoric society. So states the Encyclopedia Britannica article on Anthropology in the 11th (1910) edition, some fifty years after the publication of Darwin's Origin of Species (1859). Until the 19th century, the concept "prehistoric man" did not exist. Not until the mixture of geological discovery and Darwinian evolutionary theory had come together was the conception of "earlier stages of man" one which could be popularly entertained. In fact, the earliest use of the term "prehistoric" itself, as recorded in the Oxford English Dictionary, is in the title of a book published in 1851, D. Wilson's "The Archæology and Prehistoric Annals of Scotland," in which he speaks of "the prehistoric races of Northern Europe." Discoveries in Scandinavia in the earlier part of the 19th century had already given rise to the ideas of Stone Age, Bronze Age, Iron Age tool-making. In 1868, in a shallow cave at Cro-Magnon, in southern France, human skeletons were discovered which proved to be 10,000 to 35,000 years old, providing evidence for Cro-Magnon man: "modern" humans have been around for a long time! The earliest citation for "caveman" in the OED is from 1865, in Lubbock's Prehistoric Times (x. 255) "These ancient Cave-men..." Another reference from the same year as Waterloo's 1897 novel, (below) is M. Kingsley, W. Africa (x. 208): "These pots have a cave-man look about them; they are unglazed unlidded bowls." The Century Dictionary (1914) cites under "caveman": Same as cave-dweller, with an undated quote from John Fiske (1842-1901) from Evolutionist (p.45), "The bones and implements of the Cave-men are found in association with remains of the reindeer and bison, the arctic fox, the mammoth, and the wooly rhinocerous." The accompanying citation is from Science III, 489: "Our knowledge of primitive man in Europe, during the paleolithic age, is mainly confined to what has been learned in regard to the life and habits of the so-called cave-dwellers." It was therefore virtually impossible for "prehistoric fiction" to arise until the ground was fertile enough to support it, at the end of the 19th century. The apparently earliest example of prehistoric fiction, and in fact most of the early examples, comes from France. Marc Angenot, (in "Science Fiction in France Before Verne," Science-Fiction Studies no. 14 [Vol. 5, Part 1], March 1978) refers to Pierre Boitard's "Etudes antédeluviennes — Paris avant les hommes. L'Homme fossil" [Antedeluvian Studies: Paris before Man. Fossil man.] as "...the first Darwinian narrative, and in it the pre-historical ape-man makes his appearance." Published posthumously in 1861, was this the first prehistoric novel? Read some of it yourself, introduced here. Hints of prehistoric fiction appear in Jules Verne's Journey to the Center of the Earth, published in French in 1864. During the fabulous journey the travelers discover a prehistoric version of the earth far beneath the earth's surface, where they briefly spy a giant keeping watch over a herd of mastodons, "His height was above twelve feet. His head, as big as the head of a buffalo, was lost in a mane of matted hair. It was indeed a huge mane, like those which belonged to the elephants of the earlier ages of the world." The voyagers wisely decide to quickly depart the scene, and so ends one of the earliest fictional glimpses of prehistoric man. There are a few more, but the earliest series of prehistoric novels are Rosny's (1887...) 1892 Vamireh, roman des temps primitifs, discussed below. A novel of the Pueblo Indians, The Delight Makers (1890) by Bandelier, and Stanley Waterloo's The Story of Ab: A Tale of the Time of the Caveman (1897), bring the genre into English. Waterloo accused Jack London of plagiarism in his 1907 Before Adam, which in fact hardly seems similar. "Allan & the Ice-Gods," David Pringle's article on early prehistoric fiction, from Jessica Salmonson's Violet Books site. "Origin of Man," Brian Stableford's article on the genre in The Encyclopedia of Science Fiction (1995). "An International Bibliography of Prehistoric Fiction," Marc Angenot and Nadia Khouri: the introduction to their (1981) bibliography, from Science-Fiction Studies. In his introduction to Romans Préhistoriques Baronian distinguishes between "true" prehistoric novels, and what might be called "semi-" prehistoric novels. Basically, the pure prehistoric takes place completely in prehistory, and is told from the point of view of the characters of the time, like Rosny's Quest for Fire or Auel's Earth's Children series. One frequently occuring variant might be called the "time travel" type, including Rosny's miniature La Grande Énigme, below, or Doyle's Lost World, and London's Before Adam. In this type, there is contact between modern man and prehistoric society, but the prehistoric "point of view" may not be presented at all. (The most extreme examples of this latter type can probably best be called "prehistoric-related," and kept separate from the main list. These are essentially stories of prehistoric individuals who have somehow found their way into modern novels. One example is Michael Bishop's Ancient of Days, in which a Homo habilis man finds himself in a modern setting. Other possible candidates for this group are Canter's Ember from the Sun and Hanlon's Circle Home. A third type is somewhat problematical, and might be called the "Native American" type, like so many of the Gears, or Sarabandes, and Bandelier's 1890 Delight Makers. In these novels, the culture is somewhat more archaeologically understood, and often the setting is actually A.D. These novels differ in one sense in that they are slightly less speculative, as often they are based on "considerable" anthropological research. The human actors themselves are "modern man," even if their societies aren't. 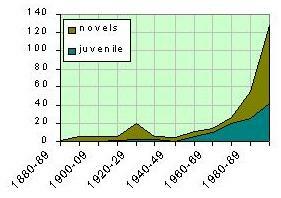 Another distinction I've made is between "juveniles" and "novels"; I use the "novels" to represent books intended for adult readers, as opposed to children or teenagers. The "young adult" novel is a grey area, but I've grouped them with the juveniles. In many cases I've used the publisher, or size (number of pages) and percentage of illustrations to make the "juvenile" designation. This displays a fairly dramatic "landscape." 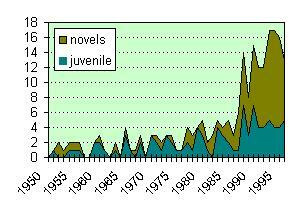 Juvenile prehistoric fiction might be said to have started in the 60s, with a fairly steady publication rate since then, and "adult" prehistoric fiction seems to have started in the 80s, and been growing at a much faster rate. And the total has about doubled every decade since the 50s, with the 90s showing the greatest increase. These books, found by searching on-line bookstores and libraries, are arranged alphabetically by author, categorized into adult and juvenile, prehistoric, bronze age, iron age, and "related", in the Prehistoric Fiction Bibliography, including where possible, a description from the book jacket or cover, or library synopsis. Please let me know about others, or any on the list that "don't belong.". Details of the chronological breakdown can be seen in the Bibliography Chronological Index. The very earliest listings are difficult to find information about: 1861, Pierre Boitard: Paris avant les hommes; 1876, Lafcadio Hearn: The Mound Builders (short story); 1886, Andrew Lang: The Romance of the First Radical; 1887, Henry Curwen: Zit and Xoe. J.-H. Rosny is the joint pseudonym of the Belgian brothers Joseph-Henri-Honoré Boëx [1856-1940], and Séraphin-Justin-François Boëx [1859-1948], known respectively as J.-H. Rosny aîné, and J.-H. Rosny jeune, who wrote in collaboration until 1909. J.-H. Rosny Aîné was clearly the major writer: after their split, the younger brother produced little of note. Their first prehistoric novel, Vamireh, roman des temps primitifs (1892), is actually the first of a cycle of five. Eyrimah appeared in 1895, and Rosny's most famous work, La guerre du feu, roman des âges farouches in 1911. Le Félin Géant was published in 1920, and finally, Helgvor du fleuve Bleu in 1930. Jean-Jacques Annaud's highly acclaimed film, La guerre du feu, "Quest for Fire," appeared in 1981. (The earliest US publication under that title was in 1967, but presumably there was an earlier UK one.) Le Félin Géant (The Giant Cat) was translated (by Lady Whitehead) as "Quest of the Dawn Man" in 1924 (UK), and the introduction states that it ran to 40 editions in France. Author of an extremely vast body of works, member of the Académie Goncourt since its foundation, and its president for numerous years, J.-H. Rosny Aîné is incontestably the father of two modern literary genres: Science Fiction and the Prehistoric Novel. But while science fiction has developed widely in the 20th century, the prehistoric novel has attracted less attention, and in this area there is no author to be found to rival J.-H. Rosny Aîné. Predating his novel Vamireh by five years is the short story Les Xipéhuz (1887), a combination of prehistory, adventure and science fiction. A similar combination is found in the stories La Grande Énigme (1920) and Les Homees sangliers (1929). Two other "pure" prehistoric short stories are Elem d'Asie (1896) (actually a shortened version of Valmireh), and Nomaï (1897). Adolf Bandelier's 1890 The Delight Makers and Stanley Waterloo's 1897 The Story of Ab: A Tale of the Time of the Caveman, are the remaining 19th century novels, the earliest written in English. Bandelier's is a story of the prehistoric Pueblo Indians, while Waterloo's has been described (Cohen-Williams) as "a pseudo-historical novel of prehistory." Waterloo accused Jack London of plagiarism in his Before Adam. His 1914 title A Son of the Ages, the reincarnations and adventures of Scar, the link; a story of man from the beginning is also a prehistoric offering. Jack London, (pseud. of John Griffith Chaney) was an American novelist and short story writer of some 50 books of fiction and non-fiction, including Call of the Wild and White Fang. He wrote romantically of elemental struggles for survival. Before Adam (1907), one of his earlier works, is presented as the retelling of the dream memories of the writer's Mid-Pleistocene ancestor, a member of a race without fire, language or organization. The fictional author struggles with the dilemma of presenting his impressions of the life of a being not quite human, but seen through the dream eyes and awake analysis of his modern descendant. In 1912 Sir Arthur Conan Doyle's Lost World was published, a description of an expedition to a prehistoric world hidden in South America. While Rosny's novels were written from the "prehistoric" point of view, Doyle's is one of modern man thrust into a world of the past. A silent film version of The Lost World appeared in 1925, starring Wallace Beery, remade in color in 1960. 1922 saw the publication of Sir Charles G.D. Roberts' In the Morning of Time, which I have not yet read, but a reviewer comments, "he describes the beginning of human society and such discoveries as fire and the bow to a time when cave dwellers moved on to a more pastoral existence. This work is worth a comparison with William Golding's The Inheritors because of the similarity of tone and subject matter." The stories by Tarzan's creator, Edgar Rice Burroughs , make up the remainder of the early prehistoric fiction list: The Land that Time Forgot (The Land that Time Forgot, The People that Time Forgot, Out of Time's Abyss) (1924), The Eternal Lover (The Eternal Savage) (1925), The Cave Girl (1925), and Back to the Stone Age (1937), being the ones I can identify as such. A film version of The Land that Time Forgot appeared in 1975, followed by a sequel, The People that Time Forgot, in 1977. 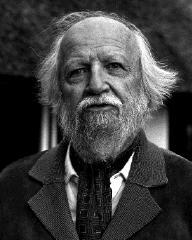 There is a hiatus of nearly twenty years before William Golding's 1955 The Inheritors appears, the immediate successor to his Lord of the Flies (1954). This seems to be the first "psychological" prehistoric fiction, for the focus is no longer on "adventures," as was mainly the case with Rosny and Burroughs (and certainly Doyle, who didn't attempt to "enter the primitive mind.") Golding's theme is the confrontation of the last of the Neanderthals with Homo sapiens, and his is possibly the first attempt to show a different kind of thinking from that of modern man. Soon prehistoric juveniles begin to appear regularly, and they continue at a rate of a couple per year up through the end of the 70s. But it is certainly the appearance and success of Jean Auel's Clan of the Cave Bear in 1980 (movie version, 1986, Warner Brothers) which set the "prehistoric fiction revolution" into motion. She continued the adventures of her heroine Ayla in Valley of the Horses (1982), The Mammoth Hunters (1985), and The Plains of Passage (1990), with two new titles promised for... 1997 ... 1998 ... 1999 ... 2000 ... 2001 ... 2002 !!?! Yes! The 5th volume, The Shelters of Stone, has been published in April 2002! You can now order it at Amazon! Read - Gillian Flaccus: "Jean Auel pieces together the past"
Other authors have made successful prehistoric novel series. The husband and wife anthropological team of Kathleen O'Neal and W. Michael Gear have published ten books in their series about Native Americans since 1990, and started a new series with "The Visitant" in 1999. By 1998, William Sarabande's First Americans series had reached #10 (since 1987), with many others having series of three or four. Interestingly, the majority of the authors are women. Inspired by Jean Auel's success? Endowed with greater sensitivity to earlier stages of humanity? Most of the novels are accurately researched, often including bibliographies, and so provide an overview of current anthropoligical research on earlier societies. Like the Gears, many of the authors are professional anthropologists themselves. Paleoanthropology Fiction by Jim Foley. "This is a list of fictional works of paleoanthropological interest. I only included books if they featured extinct hominids (so, no novels about prehistoric modern humans)." Seventh European Prehistoric Bow and Spearthrower Championship: 1997. "The prehistoric weapons contests were created to improve our knowledge of certain hunting and/or war shooting weapons which were used in prehistory..."
Cooking Clan of the Cave Bear Style! Boiling water in a skin pot over a fire (or not...) "Ayla was slicing pieces of yam to put into a skin pot that was boiling over a cooking fire..."
The Mammoth Trumpet, quarterly news magazine of the Center for the Study of the First Americans - Oregon State University - Corvallis, OR USA. paleobook, Dan Gallagher's offering of paleontological, archaeological and spiritual literature for sale (via Amazon); reviews and descriptions, including his just-published-in-May "The Pleistocene Redemption." École française de Rome, now in English, "its task is to lead and host research projects in history, archaeology, social sciences in Italy and the Mediterranean area from prehistory to our times, in any place where Rome was once the hub of the universe." Fossil Hominids by Jim Foley. "These web pages are meant to refute creationist claims that there is no evidence for human evolution..." And his new Paleoanthropology Fiction page. Lynn Armistead McKee's new book, Daughter of the Fifth Moon will be coming out soon. Shadow of the Serpent/ A Coyote Moon Story. New book by James Joseph, from Audenreed Press. Earth's Children Summer Meetings around the world. Homepage of author Patricia Rowe, Novels of Prehistoric America. Author of Children of the Dawn, Keepers of the Misty Time. Sue Harrison is currently working on volume three of her Storyteller triology, tentatively titled "Call Down the Stars." She has a webpage at www.sueharrison.com. Sue Harrison's previous "Ivory Carver Trilogy" included Mother Earth, Father Sky (1990), My Sister the Moon (1992), and Brother Wind (1994). Diane Rea-Bowie's Jean Auel's Earth's Children Jean Auel Homepage. Mammoth Trumpet Vol 10. No. 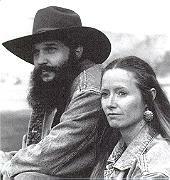 2 (1995) Includes interviews with Sue Harrison (Mother Earth, Father Sky) and Linda Lay Shuler (She Who Remembers). Margaret Allan is a pseudonym used by W.T. "Bill" Quick, author of The Mammoth Stone, Keeper of the Stone, and The Last Mammoth. A new Margaret Allan novel, Spirits Walking Woman, tentatively set for publication in Jan. 1998, is set in the Mesoamerican neolithic cultures of ancient Mexico. Marc Angenot and Nadia Khouri's An International Bibliography of Prehistoric Fiction, from Science-Fiction Studies #23 (Vol. 8, Part 1), March 1981. John Charles Beecham's 1914 story Out of the Miocene, Part I, and Out of the Miocene, Part II, from The Popular Magazine. Élie Berthet's 1876 The Pre-Historic World, translated from the French Romans préhistoriques: le monde inconnu by Mary J. Safford, 1879. And the later-published introduction to the revised edition, Un Rêve (1883). Pierre Boitard's 1861 Antedeluvian Studies: Paris before Man. Fossil man... My translation of the first and last chapters of the French Etudes antédeluviennes— Paris avant les hommes. L'Homme fossile. François Bordes's Science-Fiction and Prehistory, from Satellite, 1959. Edgar Rice Burroughs' The Eternal Savage (The Eternal Lover), from The Electronic Text Center at the University of Virginia. Gordon B. Chamberlain's The Angenot-Khouri International Bibliography of Prehistoric Fiction: Additions, Corrections and Comments, from Science-Fiction Studies #27 (Vol. 9, Part 3), Nov. 1982, Notes and Correspondence. Irving Crump's 1934-35 "Og" stories from Boys' Life: Monsters of the Mists, Wrath of the River God, The Red Beards from the North, The Saber-Toothed Slayer, The Charm That Worked, Death to the Red Beards!, Terrors of the Tundra, Cubs of the Wolf, The Place of Missing Men, Canyon of the Moon Cats, Arrows from the Sky. James DeMille's 1888 A Strange Manuscript Found in a Copper Cylinder. A Gaslight etext. Yves Dermèze's 1942 short story Le Maître des eaux; aventure des anciens âges. Three episodes of Douglas Dundee's 1933 series Cave-Boy Erek from "The Triumph" magazine. Charles Fouqué's 1950 short story Caïn. Lafcadio Hearn's The Mound Builders, article from The Commercial, Cincinnati, April 24, 1876. 1902 How the alphabet was made. from Jan Knowlton's online etext. J. Lemasson's 1943 short story The Stone of Fire, my translation of La pierre de feu. Harry Lowerison's 1906 short story Coo from his From Paleolith to Motor Car; or Heacham Tales. 1906 Inito's Axe, also from From Paleolith to Motor Car; or Heacham Tales. Edison Marshall's 1949 Famous Fantastic Mysteries story, Ogden's Strange Story (beginning chapters). André Noël's 1944 short story, Dag et Naïa; Conte des premiers âges. Edgar Pangborn's short story, The Singing Stick  a prehistoric murder mystery from Ellery Queen's Mystery Magazine... August, 1952. J.-H. Rosny's 1920 short story, La Grande Énigme, and my translation, The Great Mystery. 1932 Helgvor of the Blue River (translated from Helgvor du Fleuve bleu (1930) by Georges Surdez) serialized in Argosy. and see Éric Lysøe's 1994 analysis of Rosny's Quest for Fire, above. Marcel Schwob's 1891 short story La vendeuse d'ambre, and Iain White's 1982 translation The Amber-trader, from The King in the Golden Mask. Stacey E. Shaw's short story Shelter. Robert Silverberg's The Valley of Neander, article from his 1964 Man Before Adam (sketches the scientific background of Neanderthal man). Brian Stableford's Origin of Man, article on prehistoric fiction from The Encyclopedia of Science Fiction (1995). George Sterling's (1914) Babes in the Wood: The Saber-Tooth, and Babes in the Wood: The Wrath of Lions from The Popular Magazine. Stanley Waterloo's short story Christmas 200,000 B.C., from his 1899 The Wolf's Long Howl. A Gaslight etext. H.G. Wells' The Grisly Folk, from Storyteller Magazine, April, 1921. Stone Age Stories, from The Idler, May-Sept, 1897. A Gaslight etext. 1935 The Vengeance of Gwa (from the Sidney Fowler Wright website). Short synopses of three novels by Canadian authors: Bessette's Les Anthropoides, Kilian's Eyas, and Roberts' In the Morning of Time. Top image adapted from a photo by Roger-Viollet of "Age de pierre" by Paul Jamin [1899-].